1. Trade war developments: Global markets appear largely unfazed by the latest escalation in the trade war between the United States and China. The Trump administration announced Tuesday it will hit $200 billion worth of Chinese goods with new tariffs. China immediately retaliated, saying it will impose tariffs on US goods worth $60 billion. Chinese Premier Li Keqiang calmed the waters on Wednesday, announcing China "will never go down the path of stimulating exports by devaluing its currency." Investors were worried China might start fighting the trade war through the yuan. 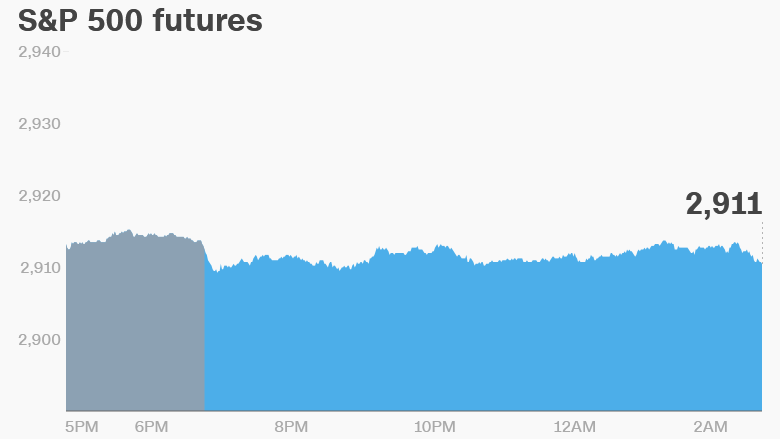 US stock futures were flat on Wednesday. European markets opened higher. Asian markets were mixed, but stocks in China and Hong Kong ended the session higher. The Dow Jones industrial average gained 0.7% on Tuesday, while the S&P 500 added 0.5%. The Nasdaq advanced 0.8%. 2. Danske Bank in trouble: Shares in Denmark's largest bank dropped over 5% after an internal investigation uncovered a large number of suspicious accounts and transactions at its branch in Estonia. CEO Thomas Borgen said he will step down once a replacement is found. Danske Bank (DNKEY) said the investigation into potential money laundering had found "a large number of non-resident customers in Estonia that we should have never had." 3. Brexit talks: EU leaders are gathering in Salzburg for an informal summit that could produce a breakthrough in deadlocked Brexit negotiations. British Prime Minister Theresa May will make a pitch to her fellow European leaders for a continued close relationship between the United Kingdom and the European Union. Businesses are increasingly worried about the possibility of the United Kingdom dropping out of the union without a deal. The issue of the border between Norther Ireland and Ireland will be high on the agenda — both sides have said they want to avoid the return of a hard border. 4. Companies and economics: Herman Miller (MLHR) will release earnings after the US close. The US Census Bureau will publish its August housing starts report at 8:30 a.m. ET. Nintendo (NTDOF) stock gained 2.4% in Tokyo after the company launched a new paid membership service, Nintendo Switch Online. Shares in Sony (SNE) advanced 0.5% after the company announced it would release a miniaturized version of its PlayStation Classic in December. British developer and home improvement company Kingfisher (KGFHF) reported a 15% drop in profits in the first half of the year. It attributed the loss to a poor performance in France. The Bank of Japan left interest rates unchanged on Wednesday, in line with expectations. UK inflation rose unexpectedly in August to 2.7%, from 2.5% in July. Economists had expected the rate to drop to 2.4%.